With decreased cycle times and greater extraction allowing shorter dry times, Maytag Commercial coin washers are smartly engineered to save more energy—helping you increase your bottom line. Our broad lineup of products deliver dependable performance that lasts and lasts. Now with Maytag Connect 360, keeping you and your customers 'connected' to your store. Check out the variety we offer to find the ideal machines for your store. A multi-load washer with one of the fastest extract speeds in the business 400 Gs - more moisture is removed than ever before. This saves customers time and it cuts your energy costs, too. New revenue-generating controls offer increased profitability from the cycles customers choose. One of the fastest rigid-mount multi-load washers in the business with 200 Gs, more moisture is removed than ever before. This saves customers time and it cuts your energy costs, too. New revenue-generating controls offer increased profitability from the cycles customers choose. ENERGY STAR® qualified to cut energy costs and maximize profits. Maytag® Intelligent controls are easy to program and operate. Plus, they give owners the flexibility to set vend prices by day, time, water temperature and PowerWash options. The Most-Durable and Best-Cleaning Top-Load Washer from Maytag® Commercial Laundry. 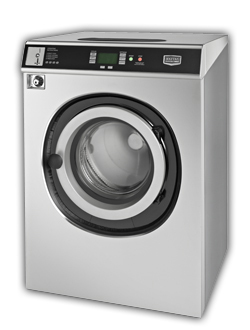 New Maytag Deep-Water Wash System, Easy-To-Use Controls, Powerful Drive System, and Heavy-Duty Cabinet.